7.5% of Australian adults aged >25 years have diabetes. We are committed to reversing the impact of diabetes on our region and around the world. Our research and practice looks at prevention of obesity and diabetes, prevention of complications among those with diabetes and studies the mechanisms behind the causes and development of obesity and diabetes and their complications. South Western Sydney Local Health District (SWSLHD) in partnership with Diabetes Obesity and Metabolism Translational Research Unit (DOMTRU) are pleased to offer a series of FREE Practice Nurse Diabetes Education Workshops. Western Sydney University will be running the Graduate Certificate in Person Centred Diabetes Care and Education commencing in Spring Session (July) 2019. This clinically focused course is designed for multidisciplinary clinicians who would like to specialise in diabetes clinical care and education. 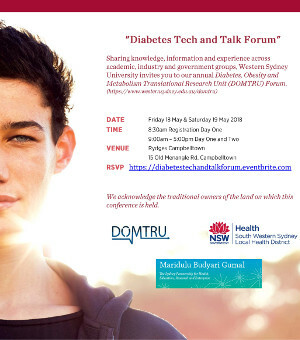 Registrations now open for the 2019 DOMTRU Tech and Talk Conference! This 2 day event will provide an opportunity to hear from leading international and national experts on the latest innovations, evidence and debates in diabetes.